For my birthday in August Pam bought me one of those DNA tests where you can learn about your heritage by mailing in some spit. I’m not sure she’s as interested in my heritage as wondering, after 37 years of marriage, if there is some genetic mutation that would explain me to her. My father has told me that, according to family lore, three Eubanks brothers (it was probably spelled Ewbanks back then) sailed over here from England in the 1700’s and landed in North Carolina. One stayed there, one settled in Georgia, and our ancestor landed in south Mississippi. But that’s family lore, so who knows? It’s actually a little boring, to be honest. Being from Ireland or Scotland seems cooler. The Irish have leprechauns, St. Patrick, and potatoes, Scotland has kilts, log tossing, and William Wallace. England has guys wearing powdered wigs. Makes having a little Neanderthal sound cool. On my mother’s side the Hoods and Latimers are from the Mississippi gulf coast, and my great-grandmother was a Latil from south Louisiana. That’s what I know. England, Mississippi, and Louisiana. The results of my DNA test came in last week, and it turns out that our family lore pretty much nailed it. I am 60% English and northwestern Europe, which is probably the Louisiana French from MaMa. Sometime in the early 1700’s my ancestors landed in North Carolina, and some stayed there, some settled in Georgia and Florida, and some on the Alabama/Mississippi/Louisiana coast. Turns out family lore is pretty accurate. 34% of my DNA does in fact come from Ireland and Scotland, probably not enough to get me to like green beer—or any beer for that matter—but that’s a full third of my ancestry so it’s not insignificant. There’s no Neanderthal, apparently, which is a relief to me but perhaps a little disappointing to Pam, as it would explain certain behaviors and habits. She is just going to have to live with the fact that I defy easy explanations. If you’ve done the math you’ve figured out that there is 6% left, and that is where the surprise was found. 6% of my DNA traces back to Norway. I’m not going to listen to anyone who says it’s “only” 6%. Viking-ness is so powerful that having even a little makes you totally, off-the-hook, Clint-Eastwood-as-Dirty-Harry bad. You don’t mess with a Viking. 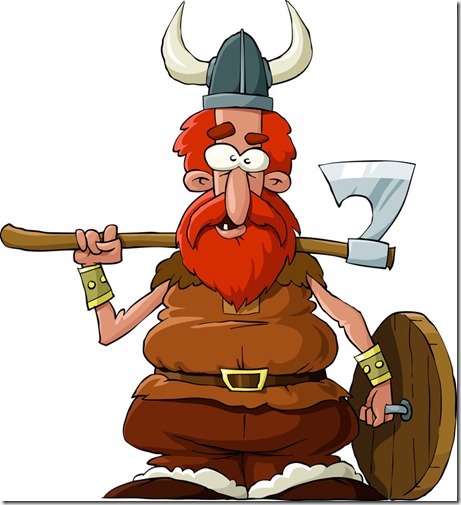 You cross the street if you see a Viking walking toward you. Vikings were the first Europeans to journey to the New World, but unlike my English ancestors, who gave Native American tribes smallpox-infested blankets that wiped out thousands, making their tribal lands open for expansion and then credited God for blessing them, the Vikings settled in Newfoundland for a time, then went back to Greenland and Norway. Canada was probably too warm. Vikings liked really cold weather. They laughed at cold weather. They were tough. They were Vikings. Except I hate cold weather. My genes literally fled colder climes for the hot, humid, mosquito-infested Deep South, where apparently they flourished. I’ve lived in Maryland long enough to call it home but I’ve never adjusted to the winters. Doesn’t make me any less Viking. I’ve never tossed a log or swigged green beer; there is also no (photographic) evidence of me wearing a powdered wig either but I’m still English with a decent dose of Scots/Irish. And Louisiana French. Kinda makes me wonder what all the immigration fuss is really all about.